You can buy novelty egg/kitchen timers by the bucketful if you do a quick online search. But almost all of them, whilst fun looking, use a standard bell to alert you when the time is up. 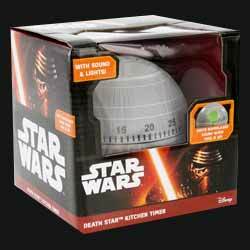 What's great about this Star Wars: Death Star Kitchen Timer is that when the time runs out it emits a loud sound effect of it powering up and then firing. And, to ensure that you know that it's still got plenty of battery juice, it emits a green flashing light (super laser designed to destroy planets) every few seconds. For food that is cooked to perfection, all you have to do is rotate the top hemisphere to the required time to start the countdown (up to 60 minutes). It has a spring wound mechanism and a non slip rubber base. It requires 3 x AAA batteries to ensure the flashing light and sound effects play (thankfully these are included and already installed). It's surprisingly large, measuring 4.2 x 4.2 x 3.6 inches. 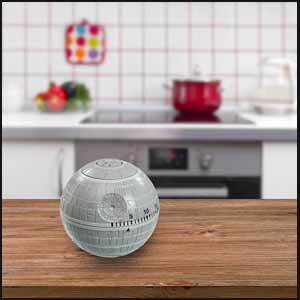 This is far and away the best novelty kitchen timer I've seen to date, and an essential purchase for every Star Wars fan.